2008: I came back to Willisham on a beautiful late winter day in February 2008. To be honest, I was not expecting to get inside. There is a keyholder, but they are far away at the other end of the village, and it was a Saturday morning, a time most keyholders go shopping in the nearest town. We tried anyway, but there was no answer. It was just as it had been nearly nine years previously. That there is a keyholder at all is an act of kindness, but there is no reason at all for this pretty little Victorian church not to be open every day. It is a prominent landmark in the fields around, its single bell ringing out across the valley at service time. By being open, it would be an act of grace and witness to pilgrims and strangers, not to mention locals. 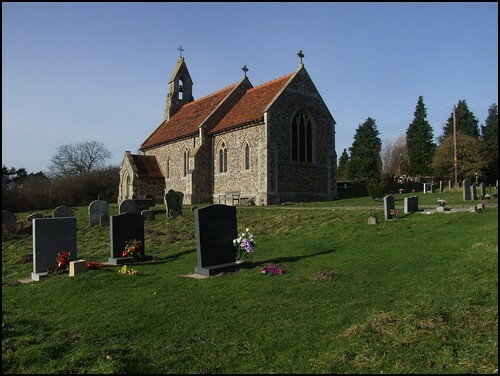 The Rector of this benefice lives in the village, and so I am sure that it would be possible if there was a will to do it. I had happy memories of my last visit here, and even with the church inaccessible it was impossible not to think of this place fondly. 1999: West of Somersham, you reach the fine Limeburners Inn; the road forks here dramatically, one way dipping down into the valley for secluded Offton, and the other climbing the hump-back into Willisham. Rather incongruously hi-tech offices stand above the rolling meadows, and the tower of Offton church peeps above the tree-line in the valley. Like many around here, Willisham is hardly a village at all; houses straggle along the road here, and at nearby Willisham Tye. St Mary's church is one of the first buildings you see, and it is visible from a long way off. Its prominent position makes up for its lack of a tower, and hides the fact that this is a small church, and, perhaps, rather an undistinguished one. But it is set in a beautiful graveyard, and the valley swallows all sound except the birds in the hedgerows. It was built in 1878 to the designs of Herbert Green, who was also responsible for Darmsden, four miles away to the east. They are broadly similar, with the little bellcote at the western end, although here, the west window is a pair of lancets rather than a rose. This church retains the medieval font of the former church on this site inside; and, unlike Darmsden, it has not been declared redundant by the Anglican diocese. Villages like Willisham are easily forgotten once you jump on your bike and pedal off, but I met a man in the graveyard here who brought the village vividly to life for me. Maurice Taylor, known as 'Razor' in these parts, has lived in Willisham and Offton all his life. He remembers, at the age of six, climbing the hill across the meadow from Offton, and seeing Willisham Hall in flames. The Hall was beside the church, where the hi-tech offices stand now. One night in 1934, it caught fire; the Fiske family, who lived in the Hall, would have burnt to death if it hadn't been for a 'backhouse boy', Ron Robinson, who raised the alarm and saved them. But the Hall, a medieval timber-framed and thatched building, was completely destroyed, and was never rebuilt. Part of the main road through the village is now called Fiske Pightle, where Mr Taylor now lives. Ron survived the fire. For many years, he ran a garage in Ipswich. He died in the 1990s, and is buried in Willisham churchyard. Mr Taylor showed me his grave. We walked around the graveyard. Mr Taylor pointed out another grave, with a large, heart-shaped display of pink flowers. It was his wife's. He had known her virtually all his life. When she was five years old, he used to meet her at the churchyard gate to walk her to school. "Now she's almost back where we started", he said. This was one of the first warm days of spring, and the churchyard was alive with wild nature waking up. The molehills I'd come across in so many graveyards this year were here, too. I mentioned the huge ones I'd seen at Bromeswell; we wondered if it might be because of the mild winter. Mr Taylor's father had been a shepherd, and he remembers, as a child, herding his father's sheep up here to graze the graveyard. I said that I'd seen this still happening nowadays, at Brome and Frostenden. He nodded. "Best thing for it, best thing for churchyard grass". I was pleased that the churchyard here hadn't been trimmed to a bowling green as at Offton. Here, the unevenness of the hillside was the pattern of history. "See that bump there?" said Mr Taylor. I looked at a low ridge in the long grass, about a metre long. "Pauper grave. Saw the parish bury a child there." The wind from the valley ruffled the grass. I thought about how little security there had been when Mr Taylor was young, and how easily we take it for granted now. "I was a choirboy here", he said. "Got a crowd of 50 or more in those days. Not more than 5 or 7 now. Still, that's the way it is". He remembered as a child clambering on the grave of Sarah Lambert, who died in childbirth aged 36 in 1910, leaving six children to mourn her loss. He showed me the gravestone, and I thought: poor woman. What a miserable existence. How hard life was, and how thankless, eking out a living in this remote place, every birth another mouth to feed, another risk. For years, this headstone had lain in the long grass, forgotten. But Mr Taylor had recently lifted it up and brought it back to near its original position at the churchyard gate. "She's nearly home now", he said quietly. "She's nearly back where she started". 2008: Not much had changed here on this pretty hillside in the intervening years. The graveyard is trimmer than it had been then, but not severely so, and there are still the lichened Victorian stones resting lazily against each other, gradually returning to earth. I stopped for a moment by the pauper's grave again, and said a silent prayer, and then looked out across the valley. It is a beautiful place. 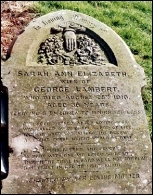 I was unable to find the headstone for Sarah Lambert which I had seen, and photographed, back in 1999. I wondered if it had been reset, but it did not appear to be anywhere around the church. I did not find Maurice Taylor's name in the graveyard either, and so I hope and assume that he is still enjoying his happy retirement.